Children whose parents help them at home and stay in touch with the school score higher than children of similar aptitude and family background whose parents are not involved. Schools where children are failing improve dramatically when parents are called in to help. The American Association of School Administrators (AASA) recognizes that schools, by themselves, can't satisfy every child's needs. Parents must be involved in their child's education at home and at school. As a guide for parents, the association has published a booklet called 106 Ways Parents Can Help Students Achieve. The booklet has been so popular that the original press run of 18,000 copies was later bumped to 300,000, an AASA spokesperson told the Indianapolis Star. Leslie Eckard, publications manager, says the Detroit public schools bought copies for every parent in the system! Here we share a handful of the suggestions from 106 Ways Parents Can Help Students Achieve, to give you an idea of what the booklet has to offer. Decorate your child's room with a large map of your state, the United States, or the world. These colorful, inexpensive maps can help everyone in the family learn more about geography. Choose a "person of the week" from the newspaper. Cut out a photo of this newsmaker and place it in a prominent place. 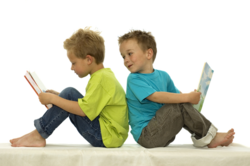 During the week, encourage your child to read as much as she can about the famous person. Try to include a range of male and female celebrities, athletes, and world leaders of all nationalities and races. Consider making a family time capsule. Put together a collection of items that preserve your family memories. You'll need a sturdy container. In your family time capsule, you might include photos of family members and pets; a favorite T-shirt; autographs; copies of old report cards; favorite old toys that are no longer being used; and much more. "Bury" your time capsule in the back of a closet. Then enjoy it in future years. Help your young child learn letters and numbers. Using crayons, make colorful posters of the "Letter of the Week" or the "Number of the Month." Find all kinds of ways to work this letter or number into your conversations and activities. Teach your child patience. Let him know that sometimes he has to wait for something. It is not always possible---or advisable---for parents to give children what they want. Teach your child that rewards often come after hard work and effort. Find ways to help your child feel important. One study by the National Family Institute found that the average parent spends 14.5 minutes a day communicating with each child. Of that time, 12.5 minutes are devoted to parental criticism or correction. Not surprisingly, those behaviors lead many children to believe they do not matter to anyone, or that they can't do anything right. Make a special effort to tell your child every day that he is special. And so go the ideas in 106 Ways Parents Can Help Students Achieve. There you will find 101 more ideas where these came from! The booklet would make a perfect addition to a "parents' library" in your school or the ideas could be used as food-for-thought fillers in newsletters published by school principals or teachers. You can probably come up with 101 uses for this valuable guide!